Paul Gaeth was a bicycle maker who added stationary engines to his business, and made an experimental steam car in 1898. His gasoline cars were unusual in using a large 3-cylinder horizontal engine of 25/30 hp. 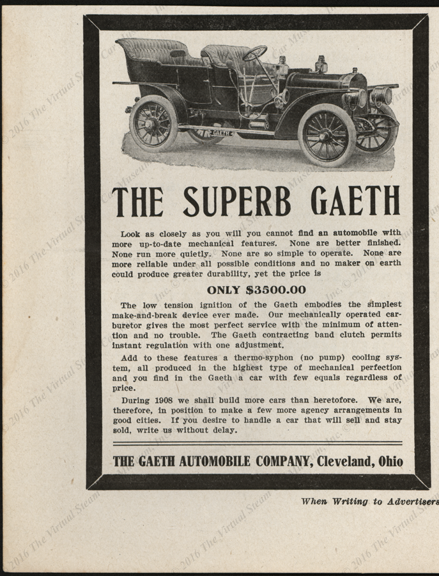 This 1908 magazine advertisement for the "Superb Gaeth" appeared in a 1908 edition of Motor Age. Georgano, G. N., Encyclopedia of American Automobile, (New York, E. P. Dutton & Co., 1968), p. 86. Contact us if you have additional information about the Paul gaeth Motor Car Company, or if you have questions.